If you follow me on Instagram you know I’ve been LOVING dressing for pregnancy this time around. 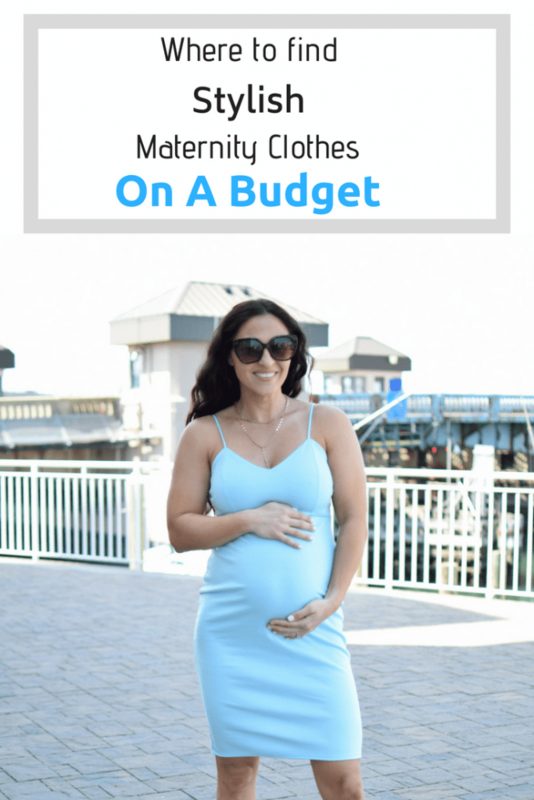 There are a million places to find maternity clothes but finding them on a budget is of course ideal since you only wear them for such a short period of time. Some of my most worn pieces are the cheapest because I tend to wear basics A LOT. Things like denim shorts, tanks and tees are what I wear most and I’ve been able to find them really cheap at some popular retailers. With that being said I want to share with you some of favorite maternity clothes and where I found them at affordable prices! Asos – Asos has pretty much every style of clothing imaginable. From basic tees and tanks to more fashion-forward dresses and tops, you’re likely to find SOMETHING that suits your style. I was able to scoop up a 2 pack of leggings for around $10 and I have worn them so many times I couldn’t even begin to count. Orders over $49.99 ship free! Old Navy – Available in sizes 1-18 ON maternity clothes offer something for everyone. While the prices for some of the maternity clothes at ON might not seem so “budget friendly” I have a tip for you! I ONLY shop Old Navy when they’re having one of their 30% or 40% off sales….which is like…ALL THE TIME. Once the sale goes live the prices are SUPER affordable. I suggest adding what you want to your cart then signing up for their email notifications. As soon as their next sale goes live you’ll get an email and your cart will already be set! Target – Target has a maternity shopping guide that helps you shop for your specific trimester which is super helpful! Instead of buying a bunch of stuff you don’t know that you’ll ever use, this guide will help you narrow it down by your current needs. They have everything from undergarments to belly bands to swimwear and more. I got a few Isabel dresses from here and wore them throughout my entire pregnancy. The dress in the photo above was one of them! They also carry a whole line of plus size maternity clothes. Amazon – Ask my husband and you’ll know just how much I love Amazon 🙂 He’s always complaining about all the boxes we get but who can resist free 2 day shipping? Amazon has everything and maternity clothes are no exception. Are there any retailers you found great affordable maternity clothes at? I’d love to hear! Share this “Maternity Clothes On A Budget : Where To Find Them” post on pinterest via the images below!